Co-founding my first company last year was the fulfillment of a dream 13 years in the making. When my obsession to create companies began back in college, it was fueled by a desire to be creative and grow rich. But after working in existing companies under multiple leaders — some who created truly toxic environments — my motivation has evolved. I care now more than ever about using business to help people flourish. Currently, one of the most distressing obstacles to people thriving is the pervasive lack of civil discourse between people of different beliefs and backgrounds. Fortunately, there is hope. There are more of us who want peace and progress than who want to go backwards, and we can use our daily work lives to make a difference. Regardless of our specific occupation or industry — from janitors to CEO’s, from manufacturing to venture backed technology — each of us in the workforce can show our communities how people from different beliefs and backgrounds can live and work together in unity. This isn’t just the moral thing to do, it’s smart. Companies who have diverse yet unified teams are more innovative and resilient (if you don’t agree, below are a few starter articles on the subject). Yet, for all the tactics I’ve heard about how to increase diversity and inclusion, one of the largest and most unspoken obstacles to cultivating authentic diversity and inclusion is the way we mentally categorize people. As humans, we use mental categories to make sense of our world. According to Paul Hiebert, the most common type of mental category is called a ‘bounded set.’ In fact, most nouns in the English language are built on this category. Our minds form bounded sets by drawing a mental circle around things with shared characteristics. We know an apple is an apple because it is a round fruit, has thin red skin, etc. There isn’t room for much variation within the category. We make thousands of instinctive and immediate evaluations every day using bounded sets. Mental categories, including bounded sets, are like tools; use a knife for the right purpose and you gain utility, use it incorrectly and someone is going to the hospital. Bounded sets become dangerous when we use them to evaluate other people in the workplace. As humans, we generally the draw mental circles using the ink of beliefs and backgrounds. When we meet a new person, we are subconsciously asking bounded set questions. If verbalized, these latent questions would sound like, “Do you believe what I believe? Do you look like me? Are you from where I’m from?” Based on the answers, we categorize people just like we categorize fruit. Are you pro-choice or not? Democrat or republican? White or Black? Wealthy or poor? Christian or Muslim? The sneaky part in corporate America is that these subconscious bounded set questions can actually sound like, “Are you a culture fit” or “Are you someone we’d want to have a beer with?” By applying bounded set thinking in the workforce, we inevitably hire, include, retain, and promote people who fit in our circle. Fortunately, there is another type of mental category. 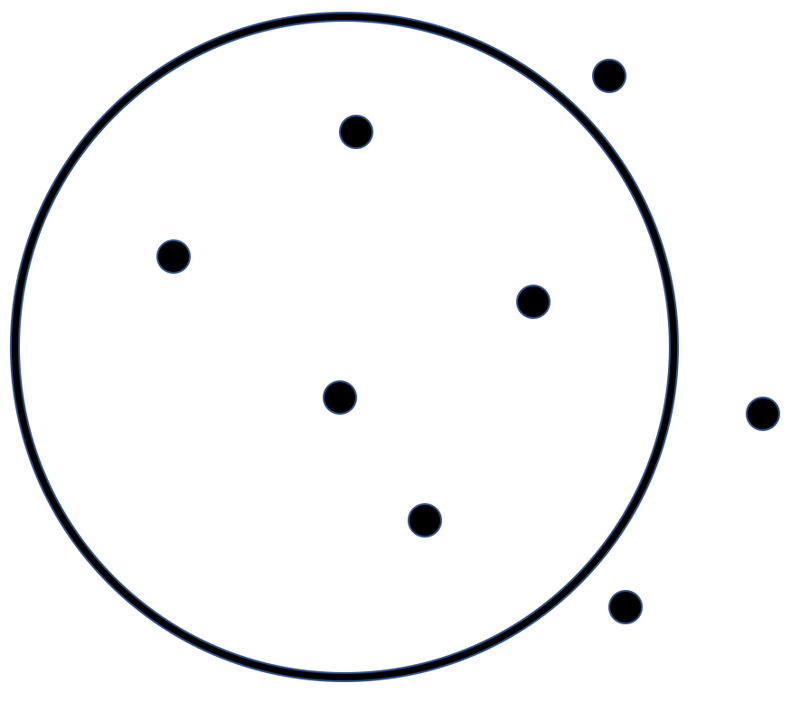 Centered set thinking starts with a center instead of a circle. It’s still a very exclusive way of thinking, but objects (or people) are categorized to be ‘in or out’ based on their orientation to the center. As Jon Ortberg once quoted, “Somebody wrote that in Australia there are two main methods for keeping cattle on the ranch. One is to build a fence around the perimeter. The other is to dig a well in the center of the property.” Bounded sets start with the fence. Centered sets start with the well. So how do we apply centered set thinking in the workforce? First, the leaders of a company must dig a deep well of company values and mission that is authentic, clear and untainted by hypocrisy. This is the first step towards creating a company culture that enables unity among diversity. Then, when we think about hiring a job candidate or including someone in a conversation, we evaluate them using centered set thinking. We categorize them based on their competency and their orientation towards the company values and mission, not their beliefs or backgrounds. For example, one of our company values is “no entitlement,” and another is “create value for all, not one.” If I’m interviewing you (or thinking about including you in a business discussion) and you look differently, talk differently, believe differently, and live differently than me, I don’t really care. The only cultural question I’m asking is, “do you care about what we care about?” If you don’t share our company values or our mission, then I wish you the best but you aren’t going to be part of our company. But if you do want to create value for all and not one, if you reject an entitlement mentality, if you care what we care about and want to go where we are going, then we can lock arms and build something incredible together. If you are Muslim, I will work with you. If you are a Christian, I will work with you. If you are LGBT, I will work with you. Regardless of gender, I will work with you. If you are you are rich or poor, young or old, black or white, native or not, I will hire you, I will promote you, I will do my best to retain you, I will serve you, and when the time comes, I will follow you. And then let’s let others follow our example of working together. Living is about more than making money, and we invest a lot of our lives at work. Let’s use our time there for good. Our peers, communities, and country need to see real people with real jobs modeling a different way of relating to others. Whether your job is sweeping a floor, writing code, or managing a team, you can lead others by showing others how to focus on shared company values over individual beliefs and backgrounds. The obvious reality is that we aren’t going to inspire everyone overnight. If enough of us apply centered set thinking in our companies though, we can dig a well deep enough that others will come and join us.